In this tutorial, you’ll learn how to use the YOLO object detector to detect objects in both images and video streams using Deep Learning, OpenCV, and Python. By applying object detection, you’ll not only be able to determine what is in an image, but also where a given object resides! We’ll start with a brief discussion of the YOLO object detector, including how the object detector works. We’ll wrap up the tutorial by discussing some of the limitations and drawbacks of the YOLO object detector, including some of my personal tips and suggestions. To learn how use YOLO for object detection with OpenCV, just keep reading! What is the YOLO object detector? Figure 1: A simplified illustration of the YOLO object detector pipeline (source). We’ll use YOLO with OpenCV in this blog post. R-CNNs are one of the first deep learning-based object detectors and are an example of a two-stage detector. In the first R-CNN publication, Rich feature hierarchies for accurate object detection and semantic segmentation, (2013) Girshick et al. proposed an object detector that required an algorithm such as Selective Search (or equivalent) to propose candidate bounding boxes that could contain objects. These regions were then passed into a CNN for classification, ultimately leading to one of the first deep learning-based object detectors. The problem with the standard R-CNN method was that it was painfully slow and not a complete end-to-end object detector. Girshick et al. published a second paper in 2015, entitled Fast R- CNN. The Fast R-CNN algorithm made considerable improvements to the original R-CNN, namely increasing accuracy and reducing the time it took to perform a forward pass; however, the model still relied on an external region proposal algorithm. It wasn’t until Girshick et al.’s follow-up 2015 paper, Faster R-CNN: Towards Real-Time Object Detection with Region Proposal Networks, that R-CNNs became a true end-to-end deep learning object detector by removing the Selective Search requirement and instead relying on a Region Proposal Network (RPN) that is (1) fully convolutional and (2) can predict the object bounding boxes and “objectness” scores (i.e., a score quantifying how likely it is a region of an image may contain an image). The outputs of the RPNs are then passed into the R-CNN component for final classification and labeling. While R-CNNs tend to very accurate, the biggest problem with the R-CNN family of networks is their speed — they were incredibly slow, obtaining only 5 FPS on a GPU. To help increase the speed of deep learning-based object detectors, both Single Shot Detectors (SSDs) and YOLO use a one-stage detector strategy. 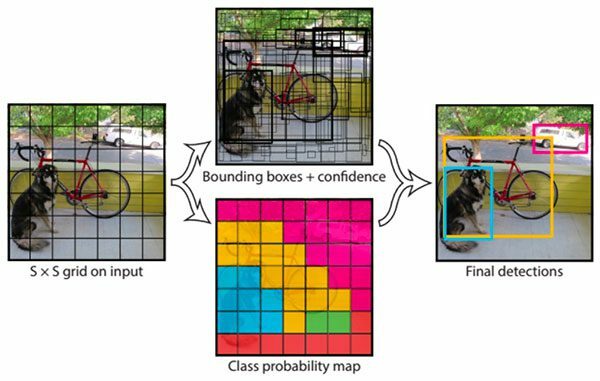 These algorithms treat object detection as a regression problem, taking a given input image and simultaneously learning bounding box coordinates and corresponding class label probabilities. In general, single-stage detectors tend to be less accurate than two-stage detectors but are significantly faster. YOLO is a great example of a single stage detector. First introduced in 2015 by Redmon et al., their paper, You Only Look Once: Unified, Real-Time Object Detection, details an object detector capable of super real-time object detection, obtaining 45 FPS on a GPU. Note: A smaller variant of their model called “Fast YOLO” claims to achieve 155 FPS on a GPU. YOLO has gone through a number of different iterations, including YOLO9000: Better, Faster, Stronger (i.e., YOLOv2), capable of detecting over 9,000 object detectors. Redmon and Farhadi are able to achieve such a large number of object detections by performing joint training for both object detection and classification. Using joint training the authors trained YOLO9000 simultaneously on both the ImageNet classification dataset and COCO detection dataset. The result is a YOLO model, called YOLO9000, that can predict detections for object classes that don’t have labeled detection data. While interesting and novel, YOLOv2’s performance was a bit underwhelming given the title and abstract of the paper. On the 156 class version of COCO, YOLO9000 achieved 16% mean Average Precision (mAP), and yes, while YOLO can detect 9,000 separate classes, the accuracy is not quite what we would desire. Redmon and Farhadi recently published a new YOLO paper, YOLOv3: An Incremental Improvement (2018). YOLOv3 is significantly larger than previous models but is, in my opinion, the best one yet out of the YOLO family of object detectors. We’ll be using YOLOv3 in this blog post, in particular, YOLO trained on the COCO dataset. Kitchen and dining objects, such as wine glasses, cups, forks, knives, spoons, etc. You can find a full list of what YOLO trained on the COCO dataset can detect using this link. I’ll wrap up this section by saying that any academic needs to read Redmon’s YOLO papers and tech reports — not only are they novel and insightful they are incredibly entertaining as well. But seriously, if you do nothing else today read the YOLOv3 tech report. It’s only 6 pages and one of those pages is just references/citations. Furthermore, the tech report is honest in a way that academic papers rarely, if ever, are. Our project today consists of 4 directories and two Python scripts. yolo-coco/ : The YOLOv3 object detector pre-trained (on the COCO dataset) model files. These were trained by the Darknet team. images/ : This folder contains four static images which we’ll perform object detection on for testing and evaluation purposes. videos/ : After performing object detection with YOLO on images, we’ll process videos in real time. This directory contains four sample videos for you to test with. output/ : Output videos that have been processed by YOLO and annotated with bounding boxes and class names can go in this folder. We’re reviewing two Python scripts — yolo.py and yolo_video.py . The first script is for images and then we’ll take what we learn and apply it to video in the second script. Let’s get started applying the YOLO object detector to images! All you need installed for this script OpenCV 3.4.2+ with Python bindings. You can find my OpenCV installation tutorials here, just keep in mind that OpenCV 4 is in beta right now — you may run into issues installing or running certain scripts since it’s not an official release. For the time being I recommend going for OpenCV 3.4.2+. You can actually be up and running in less than 5 minutes with pip as well. First, we import our required packages — as long as OpenCV and NumPy are installed, your interpreter will breeze past these lines. --image : The path to the input image. We’ll detect objects in this image using YOLO. --yolo : The base path to the YOLO directory. Our script will then load the required YOLO files in order to perform object detection on the image. --confidence : Minimum probability to filter weak detections. I’ve given this a default value of 50% ( 0.5 ), but you should feel free to experiment with this value. --threshold : This is our non-maxima suppression threshold with a default value of 0.3 . You can read more about non-maxima suppression here. After parsing, the args variable is now a dictionary containing the key-value pairs for the command line arguments. You’ll see args a number of times in the rest of this script. Here we load all of our class LABELS (notice the first command line argument, args["yolo"] being used) on Lines 21 and 22. Random COLORS are then assigned to each label on Lines 25-27. To load YOLO from disk on Line 35, we’ll take advantage of OpenCV’s DNN function called cv2.dnn.readNetFromDarknet . This function requires both a configPath and weightsPath which are established via command line arguments on Lines 30 and 31. I cannot stress this enough: you’ll need at least OpenCV 3.4.2 to run this code as it has the updated dnn module required to load YOLO. Load the input image and extract its dimensions (Lines 38 and 39). Determine the output layer names from the YOLO model (Lines 42 and 43). Construct a blob from the image (Lines 48 and 49). Are you confused about what a blob is or what the cv2.dnn.blobFromImage does? Give this blog post a read. 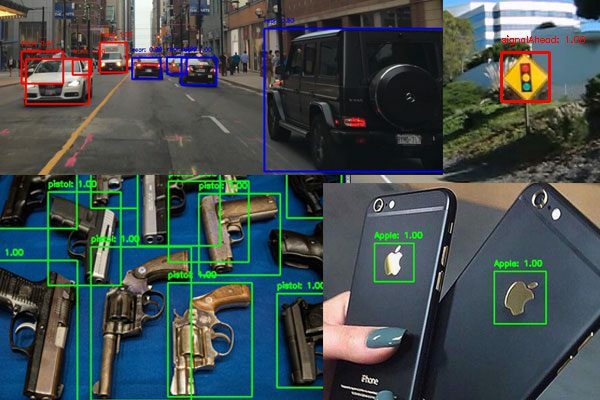 What good is object detection unless we visualize our results? Let’s take steps now to filter and visualize our results. boxes : Our bounding boxes around the object. confidences : The confidence value that YOLO assigns to an object. Lower confidence values indicate that the object might not be what the network thinks it is. Remember from our command line arguments above that we’ll filter out objects that don’t meet the 0.5 threshold. classIDs : The detected object’s class label. There’s a lot here in this code block — let’s break it down. Loop over each of the layerOutputs (beginning on Line 65). Loop over each detection in output (a nested loop beginning on Line 67). Extract the classID and confidence (Lines 70-72). Use the confidence to filter out weak detections (Line 76). Scale bounding box coordinates so we can display them properly on our original image (Line 81). Extract coordinates and dimensions of the bounding box (Line 82). YOLO returns bounding box coordinates in the form: (centerX, centerY, width, and height) . Use this information to derive the top-left (x, y)-coordinates of the bounding box (Lines 86 and 87). Update the boxes , confidences , and classIDs lists (Lines 91-93). YOLO does not apply non-maxima suppression for us, so we need to explicitly apply it. Applying non-maxima suppression suppresses significantly overlapping bounding boxes, keeping only the most confident ones. NMS also ensures that we do not have any redundant or extraneous bounding boxes. Taking advantage of OpenCV’s built-in DNN module implementation of NMS, we perform non-maxima suppression on Lines 97 and 98. All that is required is that we submit our bounding boxes , confidences , as well as both our confidence threshold and NMS threshold. If you’ve been reading this blog, you might be wondering why we didn’t use my imutils implementation of NMS. The primary reason is that the NMSBoxes function is now working in OpenCV. Previously it failed for some inputs and resulted in an error message. Now that the NMSBoxes function is working, we can use it in our own scripts. Let’s draw the boxes and class text on the image! Assuming at least one detection exists (Line 101), we proceed to loop over idxs determined by non-maxima suppression. Then, we simply draw the bounding box and text on image using our random class colors (Lines 105-113). Finally, we display our resulting image until the user presses any key on their keyboard (ensuring the window opened by OpenCV is selected and focused). To follow along with this guide, make sure you use the “Downloads” section of this tutorial to download the source code, YOLO model, and example images. 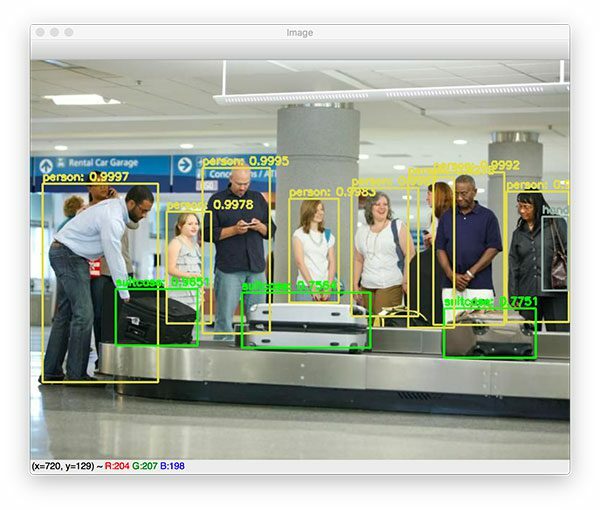 Figure 2: YOLO with OpenCV is used to detect people and baggage in an airport. Here you can see that YOLO has not only detected each person in the input image, but also the suitcases as well! Furthermore, if you take a look at the right corner of the image you’ll see that YOLO has also detected the handbag on the lady’s shoulder. 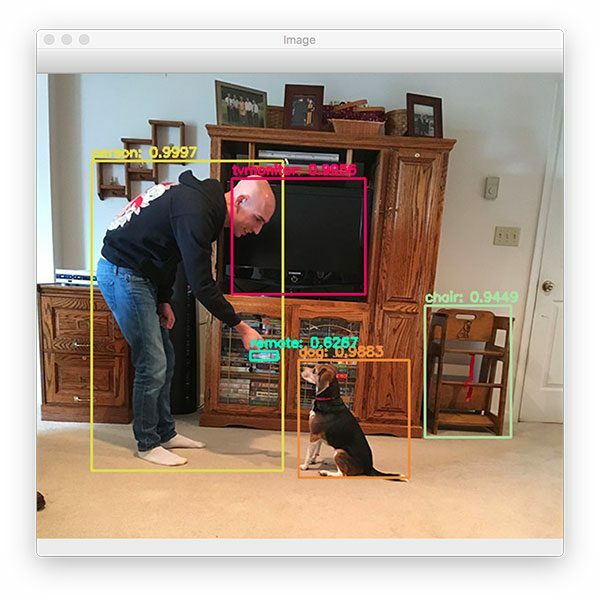 Figure 3: YOLO object detection with OpenCV is used to detect a person, dog, TV, and chair. The remote is a false-positive detection but looking at the ROI you could imagine that the area does share resemblances to a remote. The image above contains a person (myself) and a dog (Jemma, the family beagle). YOLO also detects the TV monitor and a chair as well. I’m particularly impressed that YOLO was able to detect the chair given that it’s handmade, old fashioned “baby high chair”. Interestingly, YOLO thinks there is a “remote” in my hand. It’s actually not a remote — it’s the reflection of glass on a VHS tape; however, if you stare at the region it actually does look like it could be a remote. Figure 4: YOLO and OpenCV are used for object detection of a dining room table. While both the wine bottle, dining table, and vase are correctly detected by YOLO, only one of the two wine glasses is properly detected. We discuss why YOLO struggles with objects close together in the “Limitations and drawbacks of the YOLO object detector” section below. 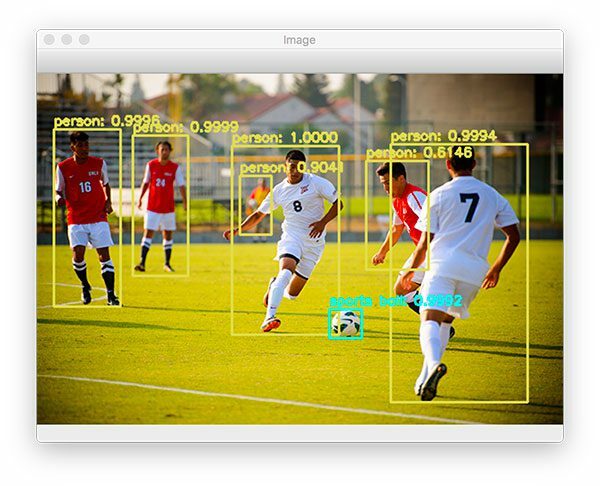 Figure 5: Soccer players and a soccer ball are detected with OpenCV using the YOLO object detector. YOLO is able to correctly detect each of the players on the pitch, including the soccer ball itself. Notice the person in the background who is detected despite the area being highly blurred and partially obscured. Now that we’ve learned how to apply the YOLO object detector to single images, let’s also utilize YOLO to perform object detection in input video files as well. We begin with our imports and command line arguments. --input : The path to the input video file. --output : Our path to the output video file. Given these arguments, you can now use videos that you record of scenes with your smartphone or videos you find online. You can then process the video file producing an annotated output video. Of course if you want to use your webcam to process a live video stream, that is possible too. Just find examples on PyImageSearch where the VideoStream class from imutils.video is utilized and make some minor changes. Here we load labels and generate colors followed by loading our YOLO model and determining output layer names. Open a file pointer to the video file for reading frames in the upcoming loop (Line 45). Initialize our video writer and frame dimensions (Lines 46 and 47). Try to determine the total number of frames in the video file so we can estimate how long processing the entire video will take (Lines 50-61). We define a while loop (Line 64) and then we grab our first frame (Line 66). We make a check to see if it is the last frame of the video. If so we need to break from the while loop (Lines 70 and 71). Next, we grab the frame dimensions if they haven’t been grabbed yet (Lines 74 and 75). Here we construct a blob and pass it through the network, obtaining predictions. I’ve surrounded the forward pass operation with time stamps so we can calculate the elapsed time to make predictions on one frame — this will help us estimate the time needed to process the entire video. We’ll then go ahead and initialize the same three lists we used in our previous script: boxes , confidences , and classIDs . Loop over output layers and detections (Lines 94-96). Extract the classID and filter out weak predictions (Lines 99-105). Compute bounding box coordinates (Lines 111-117). Update our respective lists (Lines 121-123). Apply NMS using the cv2.dnn.NMSBoxes function (Lines 127 and 128) to suppress weak, overlapping bounding boxes. You can read more about non-maxima suppression here. Loop over the idxs calculated by NMS and draw the corresponding bounding boxes + labels (Lines 131-144). Initialize our video writer if necessary (Lines 147-151). The writer will be initialized on the first iteration of the loop. Print out our estimates of how long it will take to process the video (Lines 154-158). Write the frame to the output video file (Line 161). Cleanup and release pointers (Lines 165 and 166). To apply YOLO object detection to video streams, make sure you use the “Downloads” section of this blog post to download the source, YOLO object detector, and example videos. Figure 6: YOLO deep learning object detection applied to a car crash video. Above you can see a GIF excerpt from a car chase video I found on YouTube. In the video/GIF, you can see not only the vehicles being detected, but people, as well as the traffic lights, are detected too! Figure 7: In this video of a suspect on the run, we have used OpenCV and YOLO object detection to find the person. The suspect has now fled the car and is running across a parking lot. YOLO is once again able to detect people. Figure 8: YOLO is a fast deep learning object detector capable of being used in real time video provided a GPU is utilized. Note: This video was simply too large for me to include in the “Downloads”. You may download the video from YouTube here. Figure 9: A video of traffic going under an overpass demonstrates that YOLO and OpenCV can be used to detect cars accurately and quickly. Car chase video posted on YouTube by Quaker Oats. Overpass video on YouTube by Vlad Kiraly. “White Crow” on the FreeMusicArchive by XTaKeRuX. The YOLO object detector divides an input image into an SxS grid where each cell in the grid predicts only a single object. If there exist multiple, small objects in a single cell then YOLO will be unable to detect them, ultimately leading to missed object detections. Therefore, if you know your dataset consists of many small objects grouped close together then you should not use the YOLO object detector. In terms of small objects, Faster R-CNN tends to work the best; however, it’s also the slowest. SSDs can also be used here; however, SSDs can also struggle with smaller objects (but not as much as YOLO). SSDs often give a nice tradeoff in terms of speed and accuracy as well. It’s also worth noting that YOLO ran slower than SSDs in this tutorial. In my previous tutorial on OpenCV object detection we utilized an SSD — a single forward pass of the SSD took ~0.03 seconds. However, from this tutorial, we know that a forward pass of the YOLO object detector took ~0.3 seconds, approximately an order of magnitude slower! I have found SSDs much easier to train and their performance in terms of accuracy almost always outperforms YOLO (at least for the datasets I’ve worked with). YOLO may have excellent results on the COCO dataset; however, I have not found that same level of accuracy for my own tasks. If I know I need to detect small objects and speed is not a concern, I tend to use Faster R-CNN. If speed is absolutely paramount, I use YOLO. If I need a middle ground, I tend to go with SSDs. In most of my situations I end up using SSDs or RetinaNet — both are a great balance between the YOLO/Faster R-CNN. Want to train your own deep learning object detectors? Figure 10: In my book, Deep Learning for Computer Vision with Python, I cover multiple object detection algorithms including Faster R-CNN, SSDs, and RetinaNet. Inside I will teach you how to create your object detection image dataset, train the object detector, and make predictions. Not to mention I also cover deep learning fundamentals, best practices, and my personal set of rules of thumb. Grab your copy now so you can start learning new skills. …but what if you wanted to train a deep learning object detector on your own dataset? All object detection chapters in the book include a detailed explanation of both the algorithm and code, ensuring you will be able to successfully train your own object detectors. To learn more about my book (and grab your free set of sample chapters and table of contents), just click here. In this tutorial we learned how to perform YOLO object detection using Deep Learning, OpenCV, and Python. On my machine with a 3GHz Intel Xeon W processor, a single forward pass of YOLO took ~0.3 seconds; however, using a Single Shot Detector (SSD) from a previous tutorial, resulted in only 0.03 second detection, an order of magnitude faster! For real-time deep learning-based object detection on your CPU with OpenCV and Python, you may want to consider using the SSD. If you are interested in training your own deep learning object detectors on your own custom datasets, be sure to refer to my book, Deep Learning for Computer Vision with Python, where I provide detailed guides on how to successfully train your own detectors. I hope you enjoyed today’s YOLO object detection tutorial! To download the source code to today’s post, and be notified when future PyImageSearch blog posts are published, just enter your email address in the form below. Can you make a tutarial and explain in that how can train yolo on our custom dataset?? I actually cover how to train your own custom object detectors inside Deep Learning for Computer Vision with Python. I would suggest starting there. did you show in your book training custom objects with different frameworks like Yolo,YoloV3,Tensorflow,Mxnet and Caffe with faster-RNN vs. SSD? If not, that would be great to see which framework has the best object multi detector for small and close objects. Hope you will think about this. Thanks a lot for all your great tutorials. Inside the book I focus on Faster R-CNN, SSDs, and RetinaNet. Per my suggestions in this blog post I don’t tend to use YOLO that often. Your path to the input image is invalid and cv2.imread is returning “None”. Double-check the path to your input image. Also read this tutorial on NoneType errors. I have trained my dataset on darknet and I am using your code to detect my trained images but I cannot see the bounding box. When I run in darknet, I can cleary see the output with the bounding box. Can you tell me which code I should edit? I would raise that question with the OpenCV developers. Your architecture may be different or some additional model conversion may need to take place. Thanks Aiwen, I’m glad you liked it! You need at least OpenCV 3.4.2 for this tutorial. OpenCV 4 would work as well. Awesome, I’m glad that worked. Might be worth updating the article to say 3.4.2 rather than 3.4 as it currently does. This caught me out too. I got same error on Windows. I have OpenCV-Python 3.4.0 installed. How to install opencv-python 3.4.2 on windows? I’m sorry to hear about the error message. You would indeed need to install OpenCV 3.4.2 or higher. That said, I do not officially support Windows here on the PyImageSearch blog (I haven’t even used a Windows machine in 11+ years now). When it comes to computer vision and deep learning I highly recommend you use a Unix-based machine such as Ubuntu or macOS. I have a number of OpenCV install tutorials for those operating systems. If you need help with Windows I would need to refer you to the official OpenCV website. I use python 2.7 and opencv 2.4.11 on a windows10 System. I updated my opencv by using “pip install opencv-contrib-python” and opencv 3.4.5 was installed in a view minutes. The code is running well! can it be implemented on a pi 3B? Yes, but it would be extremely slow, under 1 FPS (at least for the OpenCV + YOLO version). The Movidius NCS does have a YOLO model that supposedly works but I have never tried it — that would likely get you to a FPS. Its not the same model used in this tutorial. I’ve played with it and it was really poor at detecting people and really good at finding people in shadows (false positives) so it was useless for my purposes. The YOLOv3 model used here has performed admirably on the test images where the TinyYolo model from the NCS appzoo (linked above) failed miserably. If there is a Movidius version of this YOLOv3 model, point me to it and I’ll give it a try and report back. That was the one I was thinking of, thanks Wally. I’m not aware of a YOLOv3 model for the Movidius though. They are available, I just ordered one from Mouser for $99 + tax and shipping. The Pi is where this improved device could really help, but it looks like it needs USB3 and a specific driver which may explain the lack of Pi support. I’m expecting a challenge to get the tool kit install. Intel sent me a NCS2 but I must admit that I never unboxed it 🙁 I’ve been too busy releasing the 2nd edition of DL4CV. I’ll have to carve out some time and play with it as well 🙂 Thanks for the motivation, Wally. Perhaps a bit more motivation. I installed the openVINO SDK on that old i3 system that I mentioned in another reply (failed with library version errors on Ubuntu 18.04 , so I installed 16.04 to the free space on the drive and dual boot). Note that the CPU needed an FP32 model where the NCS used fp16. As with my MobleNet-SSD Python code, the CPU on the i3 is about the same as the Movidius NCS, but the NCS2 shows very worthwhile improvement. The SDK auto-detects NCS vs NCS2 so it was just a matter of unplugging the NCS and plugging int the NCS2 to get these numbers from the live openCV overlay. The SDK compiles openCV v4.0.0-pre. It appears to support Python Virtual Environment, although I didn’t use one. The GPU support seems not to work on this old i3-i915 motherboard. There is a C++ example for YOLOv3 object detection in the installed sample code. But my first task will be to see if I can re-write my Python code to use the openVINO Python support as from my limited test it looks like one NCS2 might be able to exceed the fps I get with three NCS sticks. Hi, Doctor Adrian, very glad to read ur blog. i have a project that should recognize and detect object in the video based on Raspberry Pi 3B+ , my boss wanna i use deep learning method, such as resnet, ssd, yolov3, etc… but, in your blog, i know it’s difficult to achieve real time…what should i do? could u please give me some advice? Hey Devin — I cover how to train your own custom object detectors (Faster R-CNN, SSDs, RetinaNet, etc.) inside my book, Deep Learning for Computer Vision with Python. I also discuss and demonstrate how to obtain real-time performance and which model is suitable for various tasks. I would suggest you start there. The downloaded tutorial code runs fine on my Pi3B+ with python3 and openCV 3.4.2, but it takes 14 seconds to process an image. Can’t imagine how this could be of any use beyond a demo. How do we custom train for customized dataset? I provide code and discuss how to train your own custom object detectors on your own datasets inside my book, Deep Learning for Computer Vision with Python. Hello Adrian, which GPU did you use to achieve this performance? I did not use a GPU, it was CPU only. OpenCV’s “dnn” module does not yet support many GPUs. This is really very cool. Thanks for sharing all these together with your valuable benchmarks. By the way, out of my curiosity, do you know what type of object detector is used in Google’s autonomous cars? SSD or other? Hm, no, I don’t know what Google is using in their autonomous cars. SSDs are rooted in Google research though so that would likely be my guess. YOLO may not win on real-world metrics, but it is clearly #1 in readability of the associated papers. It is possible to make it up and running on a GPU? That depends. OpenCV’s “dnn” module currently does not support NVIDIA GPUs. It does work with some Intel GPUs though. To be clear, your performance numbers for YOLO and SSD are for a CPU version, not a GPU version, right? Thanks. That is correct. YOLO can run 40+ FPS on a GPU. Tiny-YOLO can reportedly get past 100+ FPS. 2. YoloV3 + module dnn + GPU that FPS speed could reach for real-time applications? How could I use Yolo in real time on a laptop GPU like Asus’ GeForce 930MX? See my replies to the other comments in this post — OpenCV does not yet support NVIDIA GPUs for their “dnn” module (hopefully soon though). That said, YOLO by itself can achieve 40+ FPS when ran on a GPU. Hi Adrian, I am waits like this tutorials but now I am lucky to get from you really tanks a lot. How to train YOLO with our datasets? I don’t have any tutorials for training YOLO from scratch. Typically I recommend using SSDs or RetinaNet, both of which (and Faster R-CNNs), are covered inside Deep Learning for Computer Vision with Python. Can I use it with Movidius NCS with custom dataset? Take a look at Wally’s comment. Thanks for suggesting to read the Yolo v3 research paper, that’s easily the most entertaining and honest research paper I’ve ever read, all the way to the last line! Awesome, I’m glad you enjoyed it Robert! Hey Adrian, nice article and very useful. I tried it on Pi 3 and as you stated, it is very slow. I am getting object detection rate of 1 frame per 16 seconds. Processing of the airport.mp4 took little less than 4 hours. Looking forward to your second edition of the book. Thank you for checking YOLO performance on the Pi, Hemant! Nice timing on this, I just finished installing Ubuntu-Mate 18.04 on an i3 system. The installation of the Movidius v.1 SDK pulled in openCV 3.4.3 (presumably from PyPi) so I grabbed this sample code and gave it a try. The yolo is taking ~1.47 seconds. This is not a powerful machine (1.8 GHz if I remember right), but I’m getting about 10 fps with MobilenetSSD (from a previous tutorial) and one NCS stick handling 4 cameras (round-robin sampling) and near linear speed up with multiple sticks — 19.5 fps with 2 sticks 29 fps with 3 sticks. This is heavily threaded Python code with one main thread and one thread for each NCS stick and one thread for each Onvif network camera. A 4th NCS ( 9 threads) may be too much of a good thing as it drops to 24.6 fps. Although I had to have two sticks on a powered hub when I added the 4th stick for lack of ports, this may be a bit of a bottleneck as re-running the 3 stick test with two of them on hub dropped about 2 fps. I hope one of the AI gurus can compile this yolo model for the NCS, although I realize this may not be possible. Does your Xeon system use GPU (CUDA) acceleration? If so how many cuda cores? My i7 Desktop has a GTX-950 with 2GB ram and 768 cuda cores, so I’m wondering if its worth the trouble to try and enable it. I need to update its openCV from 3.3.0 to 3.4.3 before I can run this tutorial, so this could be a good time for me to try and activate cuda. I love your multi-Movidius NCS setup, Wally! I would love to learn more about it and how you are using it. As for my Xeon system, no, there is no CUDA acceleration. Although my iMac does have a Vega GPU so I suppose I could look into trying out the Intel + OpenCV + dnn drivers. Thanks for the most useful info about openCV and CUDA, maybe for openCV 4.x.x it’ll be worth revisiting. I really appreciate shared experience that saves me from a dead end! My multi-Movidius Python code uses NCSDK API v.1 and has been tested with Python 3.6 and 2.7 on Ubuntu-Mate 18.04, Raspbian Stretch on a Pi3B+ with Python 2.7 and 3.5, and Ubuntu-Mate 16.04 with Python 3.5 virtual environment (I never setup the virtual environment for python 2.7). If no Movidius are found, it drops down to using your Caffe version of Mobilenet-SSD on the CPU with one thread per camera. On an i3 (same four cameras) its getting ~29 fps with three NCS, but it falls apart with no NCS only getting ~8 fps and its clear the camera threads that are waiting for the AI threads. Just not enough cores for the CPU AI. On a Pi3B+ with three cameras its getting ~6.7 fps with one NCS (5 threads), ~11 fps with two NCS (6 threads), and ~13 fps with three NCS (7 threads). Two NCS seems to spend significant time waiting on the AI, while three NCS appears to spend significant time waiting on images, based on summary counts in the threads that the camera thread would block on queue.put() and the NCS thread would block on queue.get(). Right now its only supported input is Onvif netcameras via their “snapshot” URL. The single stick version used your imutils to optionally use USB cameras or the PiCamera module, but I ripped this support out of the multi-stick version as few USB cameras work with IR illumination and only one PiCamera module can be used on a Pi as far as I know. I need four cameras minimum, my use is for a video security system where a commercial “security DVR” provides 24/7 video recording while the AI provides near zero false positive rate high priority “push” notifications when it is armed in “not home mode”, audio alerts (via espeak-ng) if armed in “at home mode”, and nothing when in “idle mode”. I’d be happy to send you the Python code if you are interested, in fact I’d like to see if it works on a Mac. The CPU only part runs on Windows 10 and 7 (no NCS support without way more effort than I’m willing to apply) in limited testing with the single stick (AI thread) version (I’ve removed the Windows support from the multi-stick code). I’ve totally given up on Windows since I retired, but a couple of Windows only friends were interested early on (hence the Win7 and Win10 tests), and I must say that this was by far the best cross-platform development experience I’ve ever had! Python has really impressed me! I plan to put it up on GitHub eventually, the Ubuntu 18.04 and PyPi openCV install was so easy I finally think I could write a README.md (in a reasonable amount of time) that someone could actually use from a fresh install of Raspbian or Ubuntu. Hi, Dr. Adrian. It would be nice if you tried using an Intel iGPU + OpenCV + dnn module. My laptop has a Nvidia GPU (not well supported yet) and an integrated Intel GPU, but I couldn’t make it work (net.setPreferableTarget(cv2.dnn.DNN_TARGET_OPENCL)). Anyway, if you try something, let us know. I would like to know if it indeed improves the performance. Thank you for another incredible post. Cheers. I unfortunately do not have an Intel GPU right now. I hope to try it in the future though. Perhaps another reader can share their experience. I always had this question in mind, even though it should be the fastest detector, whenever I use it in real time video detection, it gets slowest even than normal cnn which works pretty fast in my laptop. Is it because I have amd graphics card instead of NVidea or something else? Was just confused… let me know if you have suggestions regarding the same. I saw it takes about 1.3 sec to detect all the individual objects in one frame. But how is it able to detect objects quickly in your predefined videos, I just changed those to make it real time and it again went super slow, please let me know what is the actual issue. Keep in mind that the YOLO model is not accessing your GPU here. The YOLO + OpenCV implementation is running on your CPU which is why it’s taking a long time for inference. Adrian, as always, you have a nice tutorial. Thanks a lot. You can speed up the YOLO model on CPU by using OpenMP. Open makefile, and set AVX=1 and OPENMP=1. Thanks Jason. How much of a speed increase are you seeing with that change? I have not had the chance to download your codes yet. I am currently using my own data to train YOLOv3. It takes a lot time to prepare the images for training because you have to draw a bounding box for each objects in each images. Once I finish the training, I will let you know the speed difference between turning OpenMP on and off in prediction. By the way, you can also set OpenCV on and off in YOLO. Hi Jason, could you give some detailed info about OpenMP? How one should make use of it? And, where does that makefile reside? Nice tutorial for Yolo and valid comparsion with other object detection models. I want to detect small objects, so more interested in Faster-Rcnn resnet models, In this blog I can see you have mentioned they will outperform with ~5fps. I am using Faster-Rcnn resnet101 model in GPU 1080, but I am getting only 1.5 fps. Can you please suggest how to improve the speed. And as a user want to ask, When can we except a blog on Faster Rcnn Models and their advantages with custom training. Hey Balaji — I actually show you how to train your own custom Faster R-CNN models on your own datasets inside my book, Deep Learning for Computer Vision with Python. I also provide you with my tips, best practices, and suggestions on how to improve your model performance and speed. Be sure to take a look, I think it will really help you out. What performance do you expect when run with a Tesla V100 GPU with 608×608 images? With darknet, I can process images with yolo between 80-90 fps. Yolo is typically much slower when implemented in python–does this opencv implementation also have a significant reduction in performance compared to darknet? OpenCV doesn’t yet support NVIDIA GPUs with their “dnn” module so we cannot yet obtain that benchmark. NVIDIA GPU support is coming soon but it’s not quite there yet. Oh Adrain!!! Awesome,am implemented successfully without any hasle..thankx for your contribution . Thanks Adam — and thank you for being a PyImageSearch reader. What could you think about problem with real-time video from web-cameras? In our project (on-line detecting cars and peoples) when we used OpenCV3 with real-time video, we got big delay between frames… We solved this problem, but now we don`t using real-time video-streams from OpenCV. Could you have sample with real-time stream, not mp4 or avi-files? Keep in mind that deep learning models will run significantly faster on a GPU. You might want to refactor your code to use pure Keras, TensorFlow, Caffe, or whatever your model was trained with, enabling you to access your GPU. More GPU support with OpenCV is coming soon but it’s not quite there yet. Great tutorial ! But I notice that the code doesn’t work with grayscale images. Is there some parameters I can tweak to make it work? Hey Adrian, this is a great post and I really liked the way you put everything in sequential order. I have a question though. I was wondering how can I replace the YOLO model for this object detection with Faster RCNN to suit my purposes as I have fairly small objects in my videos which I need to detect. I mean is there a deploy model and prototxt available for Faster RCNN? Keep in mind that loading Faster R-CNN models is not yet 100% supported by OpenCV yet. It’s partially supported but it can be a bit of a pain. In my experience RetinaNet tends to be slightly slower but also (1) slightly more accurate and (2) a bit easier to train. thank you for replying, Adrian. that’s helpful information. This is a great tutorial, can’t thank you enough. Double-check your path to the input weights and configuration file. It sounds like your paths may be incorrect. Is there a way to specify particular object to detect? For instance only cars and stop signs. It should speed up process I suppose as resources are not wasted on recognition of other objects. You can fine-tune the model to remove classes you’re not wanted in but keep in mind the number of classes isn’t going to dramatically slow down or speedup the network — all the computation is happening earlier in the network. The article you explained very interestingly for a beginner. Can we implement a smoke detection from image using yolo? Or only for hard objects? Object detectors work best for objects that have some sort of “form”. Smoke, like water, doesn’t have a true rigid form hence YOLO and other object detectors would not work well for smoke detection. Thanks for another great tutorial, Adrian! The YOLO model is trained via the Darknet framework. We need to explicitly supply the output layer names into the call to “.forward()”. It’s a requirement when using Darknet models with OpenCV. I’m getting 0.5 fps on a 1.7Ghz processor which intel core i3 4th gen. Is that okay speed for this model and system. Given that the model is running on the CPU, yes, those results seem accurate. Nice tutorial…have you tried running YOLOv3 in C, given that it was originally written in C? I haven’t tried in C but I know there is the darknetpy wrapper which can be used to run YOLO on a GPU. Hi, Can you please tell me if I can run this code on Windows or not? I am stuck in Windows and cannot find a comprehensive tutorial of Yolo in Windows. Please help. Since this is a yolo detector with OpenCV, it is not using the gpu, right? I’m getting 1 fps on a Intel core i7 2.2 Ghz processor, which is really slow. any reason you can see? Thanks! Correct, the YOLO detector is running on the CPU, not the GPU. Please see the other comments on this page where I’ve addressed OpenCV’s GPU capabilities. Can we count people using YOLO based Approach? If so, then what changes should be made in the code or need to use my own data set to train the model? I actually describe how to build an people counter in this tutorial. First at all let me thank you for your all posts, really it is very useful for all. I would like to ask you can we use the deep learning to estimate the detect object position ? can you share some links ? Could you elaborate on what you mean by “object position”? What specifically are you trying to measure? Hi Adrian, first of all, Thanks for your help and time to do this kind of tutorials. I really appreciate your help. Adrian, I would like to know if you recommend these algorithms to apply in a project to identifying, tracking and counting people in real time, if not what technique would you recommend me? I forgot mentioning that the project is for doing it on a raspberry pi 3 b+. Take a look at my tutorial on building an OpenCV people counter. I include suggestions on how to adapt it to the Raspberry Pi. After running the yolo_video.py, it does’t display the video window, Why? Hello ,Adrian.Thank you for your post!and i have a question that i want to know the number of people in an image.how to do it using YOLO? You would loop over the number of detected objects, use an “if” statement to check if it’s a person, and then increment a counter. Make sure you are using the “Downloads” section of this blog post to download the source code and example models. It sounds like you don’t have them downloaded on your system yet. No, OpenCV does not support loading GIFs. You’ll want to convert the GIF to a series of JPEG or PNG frames, then feed them through the YOLO object detector. Hi Adrian, thanks for your great tutorials. I have a question about the line 70 of source code in yolo.py. the length of detection is 85. detection[0:4] represent coordinates ,width and height. detection[5: ] represent the probability of 80 objects. I find the detection is not used. so I want to know what detection stands for. EXCELLENT TUTORIAL, Adrian as usual from you. Thank you very much for sharing your knowledge! Hi Adrian. Great tutorial! Extending your code I’ve been able to add the SORT algorithm to create a first approach to a traffic counter. I was thinking on open sourcing the code on Github (link removed by spam filter). Is it ok for you if I do that? I will cite your tutorial, pointing back to this page. Hi Guille — congratulations on building a traffic counter, awesome job! Yes, feel free to open source the project, please just link back to the PyImageSearch blog from the GitHub readme page. Thank you! i am new to deep learning computer vision , i have downloaded the source code from your site. Please note that I only support Linux and macOS on this blog. I do not officially support Windows nor do I provide Windows install tutorials. I would suggest you follow my OpenCV install guides on either Linux or macOS to get up and running. At this time I do not have any tutorials on Intel’s OpenVINO toolkit. I will consider it for the future but I cannot guarantee if/when I may write about it. Hi Adrian, thank you for the tutorial,I;ve been following your post for a while now,I would like to know if its possible to traiin my own dataset to detect violent scenes in videos,it will be very kind if you could help us with that,thank you again. What you are referring to is called “activity recognition”. I don’t have any tutorials regarding activity recognition (yet) but I do have a chapter inside Deep Learning for Computer Vision with Python which does show you how to detect and recognize weapons in images and video. That may be a good starting point for your project. Cheers for this Adrian, it’s been exactly what I needed. I’ve now adapted the code to work with my home CCTV! Before my CCTV would FTP a short video when motion was detected to my server, and then I would use python to split the video into frames and email a picture of frames from 1sec, 3sec and 5sec to my email address, so where ever I am in the world I get an image of what triggered the motion sensor. Problem is, that I kept getting images of cats, birds, heavy rain etc. What I’ve done now is edit your code, so now when I get images from 1, 3 and 5secs. I run them through the code, check if the label is “person”, “car”, “truck” etc. and if so then attach the images to the email and send it. Awesome, congratulations on adapting the code to your own project Chris! Thank you for great tutorial ,I am facing problem while executing the yolo.py for object detection in images through terminal in Jupiter notebook. What line of code is throwing that error? Thanks for the post Adrian! I’d like to know that it’s said that YOLO is faster than SSD’s so technically, on real time video feed, it should outperform them? But, when I ran it, I got 15fps in MobileNet SSD’s and around, 3fps in YOLO. You are correct that YOLO should be faster than SSD but as you found out and as I noted in the “Limitations and drawbacks of the YOLO object detector” section of the guide YOLO appears to be slower. I’m not sure why that is. You can use the “Downloads” section of the blog post to download the YOLO model. The code will work on Windows. I am very glad that I found your blog and I have started tutorials given by you. I am using this tutorial in my project. My project is to find the ball and track it. So will this program work on “Raspberry Pi” ? No, the object detector will run far, far too slow on the Raspberry Pi. Is your ball a colored one? If so, follow this tutorial on simple color thresholding and you’ll be able to complete your project. You have mentioned that the Raspberry Pi is too slow for object detection…does the newer Pi hardware perform any better? I’ve thought about using your tutorial to build a weapon detector using a Pi B+ with your pre trained dataset. Would this be too under powered? No, the new hardware is still too underpowered. You should look into using the Movidius NCS. Hello sir, hope you will be fine. sir, when I run this code I always get this error as below. Sir, could you please tell me that what I am doing wrong and what is the solution to this error? If you are new to command line arguments, no worries, just make sure you read this tutorial first. hello, sir hope you will be fine. sir, I used ur code which is ok and working for images but when I run the code for video it works ok and all results displayed like total time and frame time etc but at the end, the video does not display in which detection occur. so, what should I do??? The output of the video is not displayed to your screen, it’s instead written to disk as an output video file. Check your output video file. Hi Mr Adrian, thanks for your great tutorial about YOLO? Are you going to make addtional tutorial about how to train YOLOv3 model with Cocodataset (using Keras, Pytorch)? I actually show you how to train your own custom object detectors inside Deep Learning for Computer Vision with Python. I want to run yolo on imagenet dataset. I downloaded weights and configuration files for imagenet YOLO from darknet project website. Then I plugged them in the code (weightspath, cofigpath, lines 30, 31 respectively). I also edited line 21 as required. But it did not work for me. Is there anything additional that I should be doing? Great work , I just want to ask something real quick. It appears that you’ve trained yolo to detect a wide variety of objects which is amazing, but it takes somewhat of a long time on my computer to run!. The problem is , I’m only interested in detecting cats and dogs in my project ( using the coco dataset as well ) , so what would the procedure be in order to train a YOLO model similar to the one you did for these two specific classes. Instead of training your network from scratch I would instead recommend performing fine-tuning. I cover how to train your own custom object detectors, including fine-tuning them, inside my book, Deep Learning for Computer Vision with Python. This is a great tutorial. Can you please elaborate more on Real time Object Detection using my own laptop’s webcam? Hy Adrian it’s good tutorial. I want to detect objects from my webcam(Live Video). So how can i implement this code? This method will be too slow to detect methods in real-time on a GPU. For real-time object detection on a CPU I would recommend you follow this tutorial. Why does this code not display the output video..but only prints the result for video??? ?…Can you help me with how can I get the output video on screen with bounding boxes.. This code takes the output detections and writes them to a video file. You can use cv2.imshow to display the results to your screen. Do you think is there a way to calculate the speed of the vehicles from a fixed camera using YOLO or other modern CNN algorithms while doing vehicle tracking? Yes, I will be covering speed calculation in my computing Computer Vision with Raspberry Pi book. Stay tuned! Hey Bruce — you may want to try a more accurate object detector such Single Shot Detectors or Faster R-CNNs. In practice I’ve found that both SSDs and Faster R-CNN perform better “in the wild”. Hello! Thanks for the tutorial! I followed it but used a model that I trained on yolov3-tiny-obj.cfg instead. However, the results are different compared to the results I get when I run the detector using the command line. Any idea what could be the cause of it? i use pycharm , anaconda , visual studio and google colab . i need all of them . in vs and pycharm : where should i address the parametes ? You’ll need to set the command line arguments via PyCharm. Make sure you read this tutorial which includes an example. Hi! this was a great tutorial! I was wondering if there could be some way to use the same code but with the YOLO9000 .cfg and .names file. I have already tryed on my own but the program crashes. Is YOLO object detection available with OpenCV.js ? I run that your python script and ./darknet detect …. from original website YOLO, but the result of them not same , why ? the result of original command website YOLO is very correct. Are you sure you’re using the same YOLO model versions? If so, it could be a difference in the NMS parameters. I’m not sure what the default DarkNet NMS parameters are, you may need to refer to the documentation/source code. I’m comparing the results obtained with (1) yolov3 built from https://github.com/jaskarannagi19/yolov3 with (2) the results obtained with your code. I’ve noted that the results are not the same at all (and not only the probability). For example, in some cases, the 1st yolov3 detects a car while the « dnn » yolov3 detects nothing. It should be noted that the config files (yolov3.cfg) are strictly the same. The weights files (yolov3.weights) too. Your path to the input image is incorrect and “cv2.imread” is returning “None”. Double-check your input image path. You can read more about NoneType errors, including how to resolve them, here. Hi Adrian. Detection[0:4] return centerX, centerY, width, height. Detection[5:] returns the probability score for each classes. What does Detection mean? The “detection” would be the height of the bounding box. how can i use centroidtracker in yolo-detection，the coordinates are always wrong,i use “simple object tracking” to modify. I am training a Densenet model on X-Ray pictures. I would like to localize some indications on these X-Ray pictures. Do you have hints to adapt Yolo or any advice ? That’s much more of a complicated problem but absolutely doable. I would recommend referring to Deep Learning for Computer Vision with Python where I suggest how to train your own custom deep learning object detectors and instance segmentation networks. I have been working on object collision problem where I want to detect the collision between tennis racket and ball. I have used “YOLO.h5” model to detect those two object and I have achieved that detection part in my code, but I want to detect the collision and pause the video whenever a collision happens. I would recommend you instead perform instance segmentation with Mask R-CNN. You can then check and see if the two masks overlap (use bitwise operations for that). If you’re new to image processing make sure you read through Practical Python and OpenCV so you can learn the basics first, including bitwise operations. Thank you for the post. I have tested this method on my video, but as you mentioned this method does not use GPU and it is not real time. My project is about detecting objects through live and stream camera. I should use YOLO V3 for that. I think OpenCV would be useless for my project since it does not support GPU. what frameworks should I use to get this project done? Could you please guide me? I am quite desperate. Take a look at “darknet”, the author’s implementation of YOLO. It is capable of running on a GPU. Thanks for the reply. I think I did not clearly ask my question. Does “dnn” module of OpenCV support GPU now? How we can run OpenCV on GPU? I am a bit confused. I run your method, and I am giving 30sec video as an input and the output (processed video) is also 30 sec. I expected to get a longer video in the output since the code is running in CPU. How this is possible that the motions in the video are not sluggish and the video is smooth. The output video doesn’t care how long it takes for a new frame to be added to it. We just specify the output video FPS and that is the FPS rate that the video plays back at. My yolo_video.py file is running without any error but there is a bug the output file is of few a milliseconds, instead of being of full lenght as of the original video. I’ll be showing how to stream the output of the YOLO object detector to the web using Flask in my upcoming Computer Vision + Raspberry Pi book, stay tuned! could you please explain or reference the YoLo architecture ? I provide links to the YOLO papers in the guide, you can refer to them for details on the YOLO architecture. I saw some other people had similar problem on this forum so I went to the ‘Nonetype’ tutorial you suggested, but the causes described there do not match my issue. I downloaded the source code so the input file path should not have a problem. The webcam is accessible via OpenCV because I tried it in other scripts. ‘Not having the proper video codecs installed’? Not sure what this is but I successfully ran your face detection tutorial so maybe that is not the case either. Any ideas please? this issue appear when the packages of openCV did not install correctly. therefore, you have to install openCV and all its corresponding packages again and with more accurate. can we applied that code on Live videoes capture at that time by camera. Technically yes, but the FPS is going to be pretty low (in the order of 1-5 FPS on a CPU). OpenCV’s “dnn” module doesn’t yet support NVIDIA GPUs for the “dnn” module. can you introduce some tutorials and codes on Live video capture? also a tutorial for run that code on NVIDIA GPUs? I cover how to perform object detection in real-time, including using NVIDIA GPUs, inside my book, Deep Learning for Computer Vision with Python. I would suggest starting there. I was wondering if you could tell me why the original YOLO3 (from the original website) is capable of detection more object than the implementation of YOLO3 in Keras and OpenCV with the same weights? and could you please explain why there is no training in this method that you posted here? 1. Do you mean capable of detecting more object classes? 2. The model we are using here is pre-trained. Since it’s pre-trained on the COCO dataset we do not have to train it ourselves. Can i have the documentation for this project? I’m not sure what you mean by “documentation”. The entire post and code is documented. nice work , i successfully run it on some different videos. one question : it’s possible to yolo_video.py to also counting the vehicules and the pedestrians? Brilliant post, Adrian. Thanks for all the effort that goes into making your tutorials so easy to understand and put into practice. 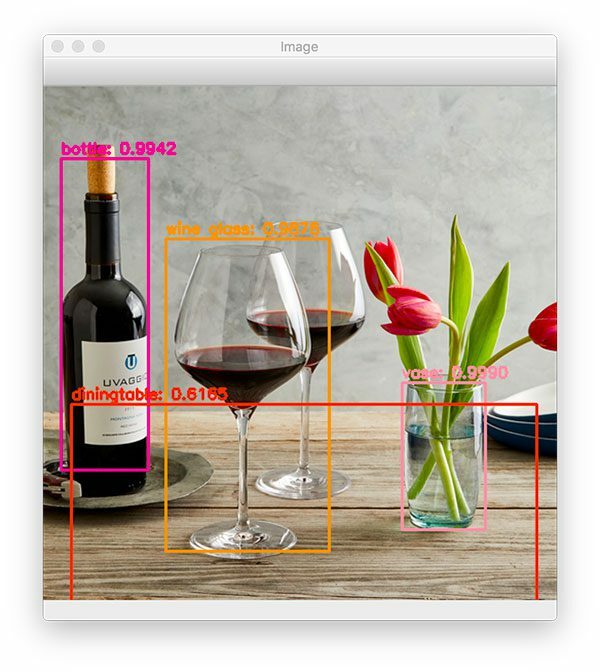 My understanding is that this model (or any other object detection model) can be trained against any (properly labeled and formatted) dataset in order to detect objects not detected by the available pre-trained models, such as those trained against ImageNet or COCO. If so then is the training process fundamentally different from the type of training that’s described in the [tutorial for facial recognition](https://www.pyimagesearch.com/2018/09/24/opencv-face-recognition/)? Also is there a way to incorporate [fastai](https://www.fast.ai/) into the process? I ask because fastai seems to be next-level over something like Keras, but I don’t know enough about it yet to know if it’s very relevant or necessary for a model training effort like this. I’ve only briefly played around with the fast.ai library. I felt that it abstracted Keras/TensorFlow a bit too much. I think Keras is the perfect level to sit on top of TensorFlow. Plus, if you need any additional TF functionality you can drop down into it from Keras. As for your training question, yes, provided you have the bounding boxes + labels you can train an object detection network. However, exactly how that network is trained can be very different based on the (1) the network itself and (2) the library that has implemented it. If you or anyone else is interested in learning more about how to train your own custom deep learning-based object detectors you should definitely read through Deep Learning for Computer Vision with Python where I cover them in detail (including code). this is an awesome tutorial! Both the image and video implementations work great. One thing I’m not overly excited about though is the speed issue, especially when the video file you’re testing is long. 1) What do I need to change in the code to make it work for real-time object detection on CPU without too much of a delay? 2) If I want to detect just a few objects instead of all the 80 classes the model is trained on, can I just replace the yolov3.weights with a pre-trained weight file from other sources? I’m going to get your book because I want to learn more about computer vision. You can’t use this method of OpenCV + YOLO for true real-time performance on a CPU. Follow this tutorial which uses a SSD with OpenCV to achieve real-time performance. Thank for the tutorial, i successfully run on some pics and videos. I don’t understand how you are parsing the output of net.forward(). What is the object ‘detection’? Where can I found the documentation of this output? The format is the same for every model or this case refers only to YOLO? I searched within the opencv reference but I can’t find it. The format of the output volume is dependent on what model you are using. If you take a look at the post + code I have documented what the output variables are. Please give it another read as that should clarify your questions. The Raspberry Pi 3B+ is not suitable for running YOLO as-is. I’ll be covering how to run YOLO on the Pi in my upcoming book, stay tuned! Your tutorial is very great. But i have problem, when the INFO Cleanup will show up ? Open CV will be show up or we must open the output in folder output ? I try to write cv2.imshow(‘frame’,frame) after write release. But i haven’t get [INFO] Cleanup in my terminal, so i can’t showup my opencv. Could you please help me ??? The “cleaning up” is only executed after the script has finished processing all frames in the video file. I am trying to learn. Can you please help in making a counter when a car passes and also show speed just above the frame. I’ll be covering that in my upcoming Computer Vision + Raspberry Pi book, stay tuned! I’ve read the article “Python, argparse, and command line arguments” but still had problem executing on Jupyter notebook. Can you give me some hint, please? There is a section in that post that shows you how to modify the code to work with Jupyter Notebooks. Have you given it a try? thankyou sir for sharing code with proper guide. can you please tell me about how to run yolo with open cv in real time.? plz plz, this means alot .it will be a great support . Please refer to the post and the comments in the post. I have already discussed what would be required to run YOLO in real-time. – Is your code Open source ? i mean can i use it for my projects in company ? 2) From the comments above, it’s uncertain if the latest versions of opencv or dlib have GPU support now, but I actually suspect that the answer is YES. The dlib library does have GPU support but I’m not sure why you’re mentioning that in this particular post? OpenCV’s “dnn” module supports some GPUs but not NVIDIA Ones. Hopefully that will be changing this summer. Why it takes 0.3s (FPS = 3) now? Correct and I discuss that in the post — I believe it’s an issue related to the OpenCV implementation. can you provide an explanation? Did you use the “Downloads” section of this post to download the source code? Or did you copy and paste? It sounds like it may be a copy and paste or accidental error inserted into the code. If you’re not writing to video then the “writer” object should be “None”. In this case, somehow, the “writer” object thinks it was instantiated. Go back and check any edits you have made to the code. Mr. Rosebrock, do you know python module to draw in laptop / PC screen? imagine if we open laptop, open browser, watch Youtube, then…the line show up and people think it come from youtube…? or watching movie in full screen mode and the line show up to? people think it from the movie, but the truth it’s come from the screen, so we don’t need compute to capture and edit the video , only capture the screen, everything show up in laptop / pc screen will detect (like streaming webcam, then draw the line on the screen. and so many ways to implement it…CCTV and many others. the most powerfull if we can make a super mini projector, that can projecting a mini line / retangle on the glass. it’s more great than google glas i think. I would suggest trying to use this method. Hi, Adrian! Many thanks – great tutorial! Just a couple of questions: I get YOLOv3 output images with blue color dominating (everything looks dark+ blue), I understand that opencv transforms images, could you please maybe give a hint on this? Another question: is it possible to increase output window size? Thank you, Adrian, for the great tutorial! Congrats on resolving the issue, Elena!